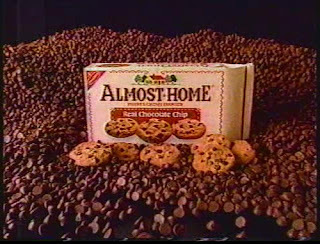 Oh man, saw these Almost Home packaged chocolate-chip cookies on Hillary's I'm Remembering and about fell over. I am not a big cookie fan (I know! Sacrilege! Not a big pizza person either! ), but Almost Home, with their sampler-designed bag, totally stuck in my head. They were a Nabisco product, and from the commercial below I guess they weren't those big soft cookies, but they look like they were. Do you remember these cookies? Or the name of the soft packaged cookies that is totally escaping me now, but that came in blue and red packages? Just got my copy yesterday and am already 1/2 way through it. Thanks for the memories. I'm embarrassed to say how much I remember. . .
were the cookies "soft batch." I remember Chip-A-Roos were big, soft chocolate chip cookies. I wish they still made them. I still have the Snoopy's Getting Married animated special on VHS from childhood!